to come back a second and third time? In spite of all your efforts to get visitors to come into your church, you’re bothered that many of your visitors don’t return. You’ve worked so hard to attract church visitors. . . . .
You desire to reach these newcomers for Christ. You know that Jesus can make a difference in their life. Perhaps you’ve spent money on advertising like a direct mail campaign or business cards members give away. You’ve designed sermon series to hopefully entice a second visit. 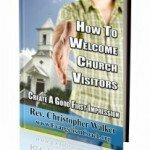 You’ve done a lot of hard work to get visitors to come to your church, but they fail to return.